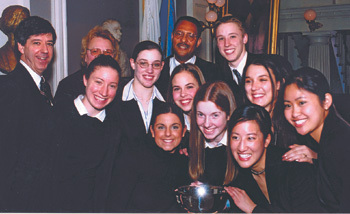 Chelmsford High School's Mock Trial team celebrates with Supreme Judicial Court Justice Roderick L.
Ireland (center back) in the Great Hall of Faneuil Hall following their win against Sharon High during the state championship round. Also pictured with the students are Mock Trial Committee Chairman Arthur J. Carakatsane (far left) and committee member Denise Coffey. On March 26, the U.S. Supreme Court issued its decision in Brown v. Legal Foundation of Washington upholding the constitutionality of the Washington state Interest on Lawyers Trust Accounts (IOLTA) program.